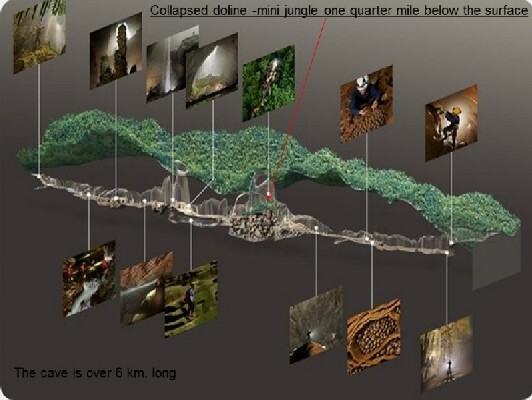 I pulled these screen-shot images from a powerpoint presentation on what is considered the world's largest cave in Vietnam -- Hang Son Doong. Some of the round structures found in the dry terrace-pools have that tell-tale equatorial ridge, possibly from electrical influence rather than drip-by-drip calcite formations. Certainly, flowing water creates caves, but like surface canyon formations, maybe water follows electrically etched caverns too. I think it's a no-brainer- it's known that electrical effects can cause ribbons, spherules, conical formations, fulguritic formations, whatnot. Really hard to come up with a hydrodynamic explanation for a bunch of 'cave pearls' nestled between the folds of delicate 'cave ribbons', doncha think? mharratsc wrote: Really hard to come up with a hydrodynamic explanation for a bunch of 'cave pearls' nestled between the folds of delicate 'cave ribbons', doncha think? 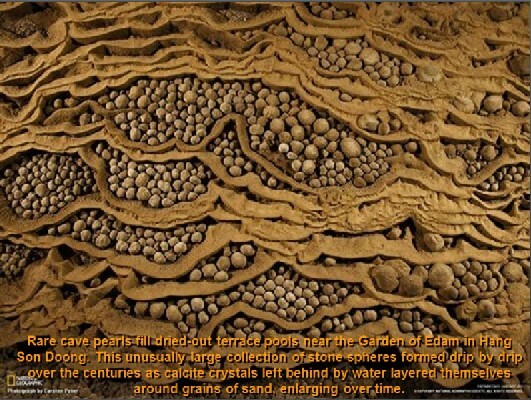 This unusually large collection of stone spheres formed drip by drip over the centuries as calcite crystals left behind by water layered themselves around grains of sand enlarging over time. The drip-by-drip formation hypothesis seems ridiculous to me too. How can a pocket full of sand grains each get a drop of calcite-rich water and form separately instead of turning into masses of stalagmites? Unless these semi-spherical rocks were formed in another place and washed downstream, I consider the drip method of formation to be the weakest explanation by dogmatic scientists. The floor of pockets itself appears to me to be an electrically induced result as waves and rivulets of electricity flowed across the cavern surface, probably forming the spheres at the same time. In the cave-layout image, the surface above the cavern dips down corresponding to not only the collapsed area, but also to the largest cavities of the cave on either side. This could be a coincidence but it's definitely something to examine closely from an EU perspective. Is this whole formation really a top-surface and subsurface crater chain that started midway and branched out in an almost linear and horizontal direction, or did the discharge start at one end, increase in intensity at the center point, and then diminish and continue to the other end, or is this simply a one-time sustained excavation that withdrew materials from the side channels toward the center? The affects of water has eroded and covered up most of the electrically induced evidence, but there's probably enough other remaining evidence to support the EU theory of (some) cave formations, if of course this was an electrical event. The 'drip drip' explanation doesn't cut it at all. Although I haven't fully understood the size scale of these 'pearls', their appearance reminds me a lot of opal and the formation mechanism could have been similar. tayga wrote: The 'drip drip' explanation doesn't cut it at all. Although I haven't fully understood the size scale of these 'pearls', their appearance reminds me a lot of opal and the formation mechanism could have been similar. If we use the image of the explorer at a floor pocket in that cave-layout image as a rough scale, I'd guess that those particular spheres are about golf-ball size. Can the little-known properties of water form those semi-spherical shapes in the pitch-blackness of a cave, or is it a combination of exclusion-zones in water and electricity that entices minerals to cling and shape? "Dr. Gerald Pollack, UW professor of bioengineering, has developed a theory of water that has been called revolutionary. The researcher has spent the past decade convincing worldwide audiences that water is not actually a liquid. Pollack explains his fascinating theory in this 32nd Annual Faculty Lecture." 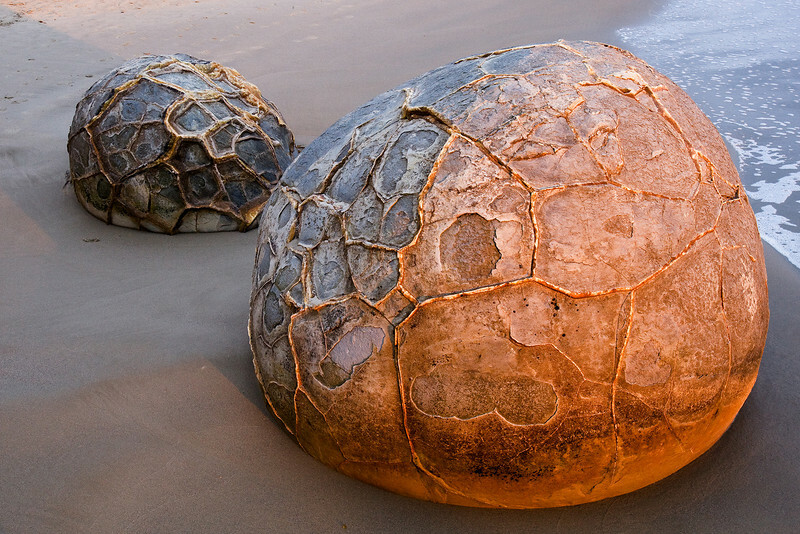 Many of the Moeraki boulders are patterned. "Bowling Ball Beach" in Mendecino, CA exhibits similar formations. I'd like to know how the stone sphere seen above could have "concreted." Hello TGD: If the air was choked with dust [see Worlds in Collision] and a plasmoid [enhanced aurora] of some sort interacted with the dust, the images of the balls You posted would be logical. The Bennett Pinch associated with plasmoids and the aurora [ http://en.wikipedia.org/wiki/Pinch_(plasma_physics) ] would attract and compress material. Because the attraction would be omni-direction, a ball shape would be expected. to as "stones of barad." Hastings, Dictionary of the Bible (1901-1904). « Papyrus Ipuwer 9 : 2-3. * Ibid., 4 : 14; 6 : 1; 6 : 3; 5 : 12.
different from the Hebrew tradition. I see stones that seem out of place all the time. The image below is from Sutter Butte, N of Sacramento CA. It appears these rocks were round and broke up upon landing. Many mountains are composed of unconsolidated conglomerate. The matrix is dirt, not rock. Within the conglomerate are boulders the size of large delivery trucks. The ancients described the boulders as the size of the trees on mountain tops. Same, same. It would be suspicious if large round boulders didn't litter the surface of Earth, in a WiC sense. From the Hebrew "matar" [hail] morphed the Greek "meteor" from which we have both meteors and meteorology. Clearly the distinction between atmospheric and interplanetary phenomena has been blurry since the beginning of language. If the causal mechanism is auroral, one still has to explain why these formations are not widespread and recurrent throughout the Earth... or are they? webolife wrote: From the Hebrew "matar" [hail] morphed the Greek "meteor" from which we have both meteors and meteorology. Clearly the distinction between atmospheric and interplanetary phenomena has been blurry since the beginning of language. If the causal mechanism is auroral, one still has to explain why these formations are not widespread and recurrent throughout the Earth... or are they? It is my understanding that the book of Joshua, in the original Hebrew, does not use the word for "hail" but rather the word "barad" which translates as meteorite. It is only in later translations such as the King James that the word hailstone is used, remember, that it wasn't until 1803 that the scientific establishment accepted that rocks could fall to Earth from space. So translators could only relate the original text to their beliefs and personal experience..."oh they say that rocks fell from the sky, but they must have meant hail!" Hello Webo: I haven't been everywhere, but round, or roundish rocks close to the surface seem quite common. These images seem compatible with the descriptions from legend and myth. I may have miscommunicated my intention in my last post. I believe the use of "matar" [hail] and "barad" [stones] in various places refers to stones falling from the sky; whether understood as icy or rocky in composition was never a linguistic definition, but strictly based on the biases of the translator, and context of the passage. In Genesis, for example, the "matar" fell first at the outset of the Flood, followed by the breaking up of the fountains of the deep, then immediately afterward by the "geshen" downpour of rain. This seems to speak directly of an astronomical catastrophe with terrestrial consequences. The "barad" stones of Joshua seem obviously to be meteorites, regardless of the author not using "matar" as the descriptive word. Regardless, from an EU perspective such showers from heaven bear the signature of electrically exploded debris, which would then beg the question, what type of electrical phenomenon was this, and how might it have affected other situations or conditions on the earth... eg. caves.